Bozburun Gulet: 16 persons Guletcharter with comfort. 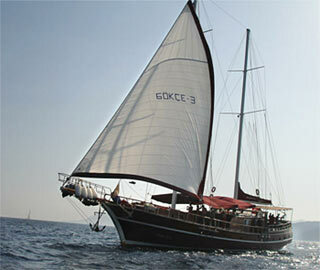 The M/S GÖKCE 3 is a newly refurbished superb motor sailor designed for full charter. She has six cabins containing a double bed, and two cabins with twin beds. All cabins have ensuite bathrooms with home style toilets and shower cabins. With a length of 30 metres (90 feet) M/S Gökce 3 offers enormous space on and below deck. (Captain, deckshand and chef) of course are accomodated in separate crew quarters. There is nearly none of the gullet charter-companies who tells you the truth about the use of air-condition on Gullets. Yes, M/S GÖKCE 3 has AC and you think you can switch it on when you like. It's not! On a boat the AC can only run when the generator is on, or in a harbor when connected to 220 Volt. But mainly you are in anchor bays, often next to a neighbor who doesn't like the noise of your generator and you wouldn't like it either during the night for example. The M/S GOEKCE 3 meets international safety regulations including life jackets, fire extinguishers and alarms.